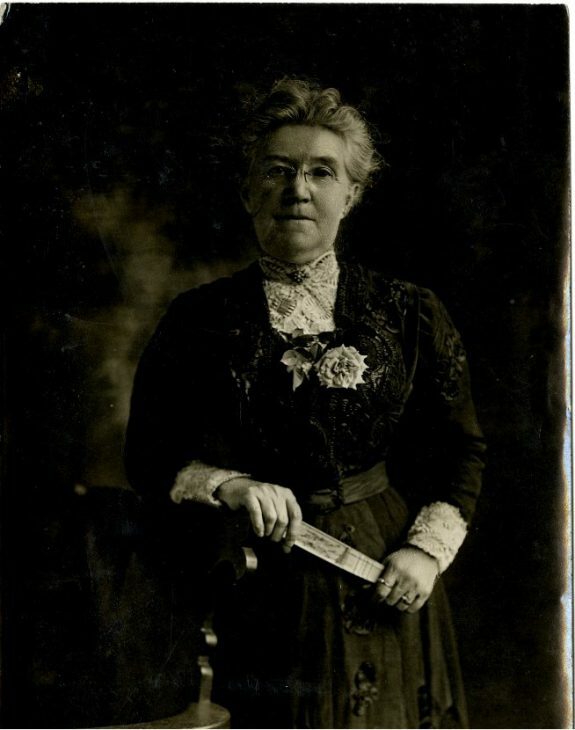 Sara Louisa Oberholtzer (1841-1930), a native of southeastern Pennsylvania, gained national stature through promoting and directing the School Savings Bank Movement. This photograph was taken circa 1892 about the time that she became involved with the thrift moment. 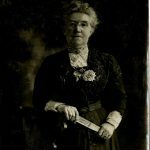 Sara Louisa Oberholtzer was a master marketer for the School Savigns Bank movement, writing endless articles for women-oriented, educational, and banking journals as well as publishing her own entitled Thrift Tidings. 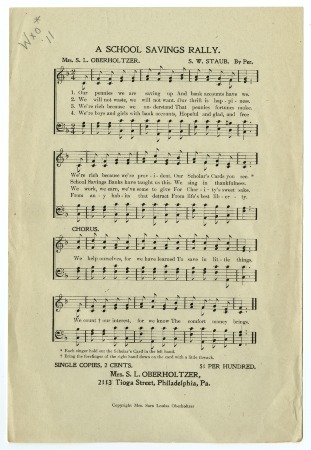 This musical ditty was written for the student audience, including hand motions to be made while holding the Scholar’s Card where weekly personal savings were recorded. 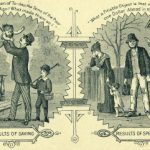 The visual culture of the thrift movement paralleled that of the temperance movement, often changing captions on similar images from “do not drink” to “save more.” The person who saves (or does not drink) lives a happy life, while the person who does not save (or drinks) destroys family and job. 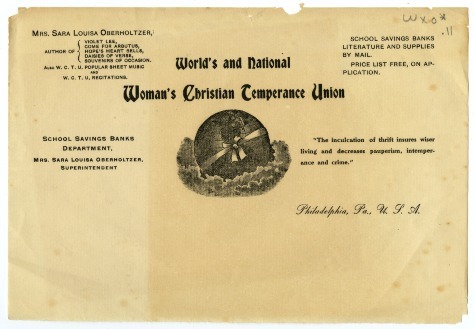 The motto on the letterhead that the National Women’s Christian Temperance Union created for the School Savings Bank Department - “The inculcation of thrift insures wiser living and decreases pauperism, intemperance and crime” - illustrates how the organization fit financial thrift into its values. 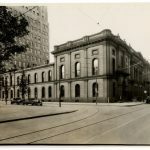 The Philadelphia Saving Fund Society (PSFS) was the nation’s first mutual saving bank, established in Philadelphia in 1816. This building at Seventh and Walnut Streets, built between 1866 and 1869, was its seventh home, although its last home at Twelfth and Markets Streets is the most well-known. Built in 1932, it was the first skyscraper in the country in the International Style. Philadelphia became a national center for the thrift movement of the late nineteenth and early twentieth centuries as a high concentration of progressive individuals and institutions promoted values of frugality, industry, and stewardship as a means for poor and working-class people to improve their circumstances. Espoused by white middle-class society, the thrift movement declined when the economic roller-coaster of the twentieth century brought an end to the savings banks and school savings banks at the core of assisting individuals in living thrifty lives. The ethic of “thrift” originated in Europe during the late eighteenth century. Closely aligned with values later called “the Protestant work ethic,” thrift emphasized hard work and strict money saving practices. Private and municipal savings banks were founded throughout Europe. By 1816, Philadelphia had its first saving bank, the Philadelphia Saving Fund Society (PSFS). 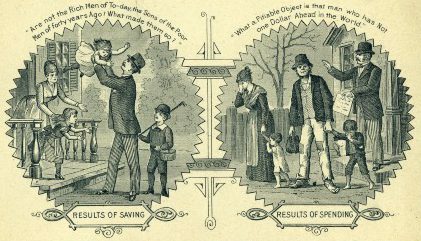 Along with other savings banks established during the nineteenth century, the Saving Fund Society encouraged individuals to save money for mortgages and retirement and provided a form of economic insurance in case of debilitating illness or the death of a family’s primary wage-earner. This form of institutional savings became popular in the Philadelphia region, where three other savings fund societies formed by 1853, and in other Northeastern states, where nearly six hundred savings banks were in operation by 1930. The existence of this type of institution did not guarantee, of course, that people would have the skills or desire to save—or be thrifty. For some, habits could be difficult to change so that saving became a priority over spending money on other luxuries, such as games, alcohol, or tobacco. Some did not trust institutions with their small amounts of hard-earned cash. To inculcate a culture of hard work and frugality, progressive thinkers turned to schools. The Quaker activist Priscilla Wakefield (1750-1832) was the first to organize “frugality banks” for women and children in England during the 1790s. With roots throughout Europe, the idea of teaching children to save through special bank programs was introduced to the United States in the 1880s by John H. Thiry (1822-1911), who then inspired the practice in the Philadelphia area when he spoke to at the American Economic Association hosted by the University of Pennsylvania in 1888. In 1889, Oberholtzer established the first School Savings Banks in Pennsylvania, mainly in towns around Philadelphia, such as Norristown, Phoenixville, Chester, and Pottstown, though there also was one as far away as Wilkes-Barre. Students brought coins to school and “deposited” them with teachers. The schools then transferred their savings into accounts at local banks, under the children’s names. In 1890, Oberholtzer became the national superintendent of the WCTU’s Schools Saving Bank Committee. The same year, fifty schools in Pennsylvania joined as the movement spread to thirty-one cities across the eastern United States. 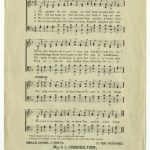 A master marketer, Oberholtzer published articles, books, and pamphlets, including Thrift Tidings, a periodical which ran from 1907 through 1923, and How to Institute School Savings Banks (1913), which sold over fifty thousand copies. She created forms, gathered statistics, and even wrote the School Savings Rally song, complete with accompanying hand motions. At the height of the School Savings Banks movement in the late 1920s, one of every six school students in the country participated in a school-based bank. A school-based essay contest organized by the American Society for Thrift in 1913 received over one hundred thousand entries and was won by a girl from Pennsylvania. Oberholtzer’s ability to garner support from the banking community also contributed to the movement’s success. During the 1910s, the American Banking Association encouraged its members to support the school savings program. 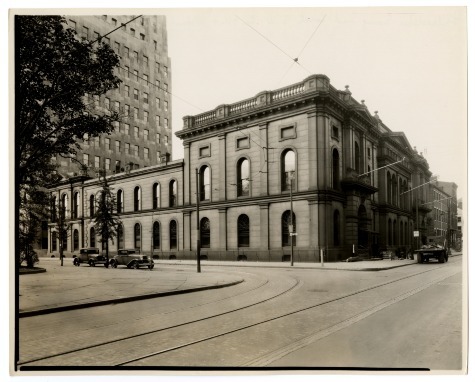 In Philadelphia, the venerable PSFS bank took up the cause and continued the program even after school savings banks nationally declined during the Great Depression and World War II from a high of 15,000 in the late 1920s to only 3,500 in 1947. Changes in the banking industry began to impact school savings bank programs. During a last gasp in the 1960s, PSFS in Philadelphia gathered deposits from students, helped them set up school bank branches, and sponsored art contests with the winning entries on display in bank lobbies. The closing of the bank once in the vanguard of the national thrift movement, beginning with a merger in 1982 and culminating in the sale of its assets to Mellon Financial in 1992, ended the systematic incorporation of thrift into local school curriculums, a trend nationwide. Born during the rise of a cash economy and consumerism in the Atlantic World, the early proponents of the thrift movement desired to help people navigate changing circumstances, but they also imposed their own values about the proper use of money. When Thiry and Oberholtzer introduced school savings banks in the late nineteenth century, they consciously or subconsciously supported efforts to Americanize immigrants, who often lived near poverty in urban areas, into white middle-class society. Changes in the late twentieth century in global economic systems made some institutions of saving obsolete; the subsequent bursting of the tech bubble and recession of 2008 illustrated to many social critics, however, the continued need for teaching thrift. Beth A. Twiss Houting is the Senior Director of Programs and Services at the Historical Society of Pennsylvania. She holds a B.A. in History from Pennsylvania State University and an M.A. from the University of Delaware in the Winterthur Program in Early American Culture with a Certificate in Museum Studies. Blankenhorn, David, and Barbara Dafoe Whitehead and Sorcha Brophy-Warren, editors. Franklin’s Thrift: The Lost History of An American Virtue. West Conshohocken: Templeton Foundation Press, 2009. Blankenhorn, David. Thrift: A Cyclopedia. West Conshohocken: Templeton Foundation Press, 2008. 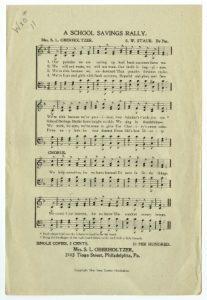 Oberholtzer, Sara Louisa. “School Savings Banks.” The Annals of the American Academy of Political and Social Science Vol. 3 (July 1892): 14-29. Pennsylvania Legacies: The Value of Thrift 12, no. 2 (2012). Yarrow, Andrew L. Thrift: The History of an American Cultural Movement. Amherst and Boston: University of Massachusetts Press, 2014. 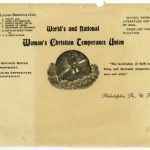 Ellis Paxson Oberholtzer Collection (1735-1931), Papers, 1735-1931, Historical Society of Pennsylvania, 1300 Locust Street, Philadelphia. PSFS Papers, Hagley Museum and Library, 298 Buck Road (library entrance), Wilmington Del. PSFS Building (now Loews Philadelphia Hotel), 1200 Market Street, Philadelphia.